Antique Regal Pottery Co. Tea Pot, Made in England, Poppy Pattern #A3145, Circa 1925-1931. A Beautiful Antique, Deep Colored Regal Ware Pottery Tea Pot from the 1920's. 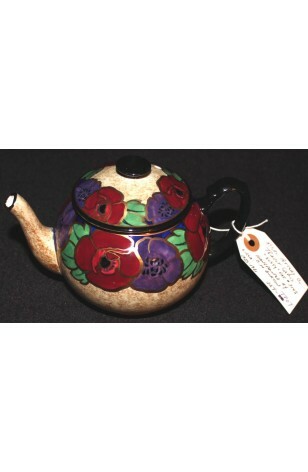 Hand Painted by C. H. Burton, in Purple and Maroon Poppies. Poppies are Outlined in 22kt Gold and Black Trims on a Beige Marbled Background. This is an exquisite Tea Pot that shows no wear. A very Dramatic Design that would Brighten up any Tea Service or Collection.